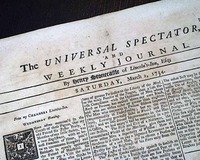 What we now refer to as "coffee-house newspapers" were originally distributed within 17th and 18th century English coffeehouses. 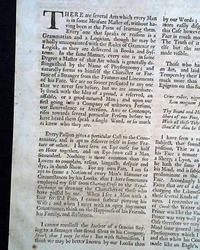 For the price of a penny, customers purchased a cup of coffee and admission, which typically included a newspaper - often printed specifically for their patrons. 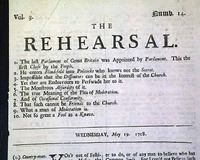 Socially similar to English alehouses, the absence of alcohol created an atmosphere in which one could engage in more serious conversation as they perused their newspaper (source: adapted from Wikipedia). 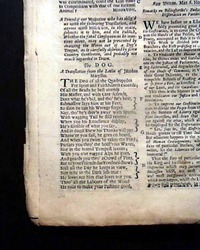 Many of these original coffeehouse newspapers are available for sale and are shown below. Please enjoy. 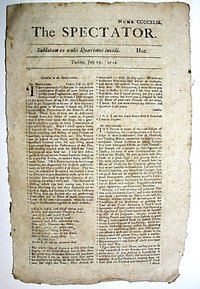 A fine single sheet newspaper which lasted only 6 years. 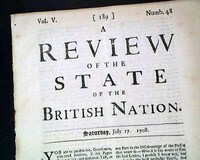 By Charles Leslie, considered a violent controversialist who was virtually inextinguishable. 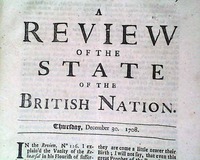 Content is discussion of various topics. 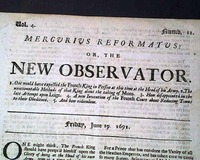 Unusual & seldom found. 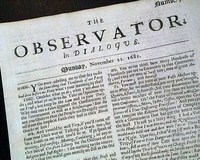 12 3/4 by 7 1/4 inches. 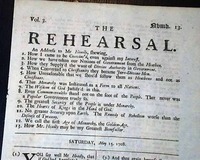 Minor archival mend on the reverse, very nice condition. 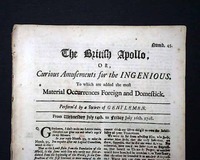 THE BRITISH APOLLO, OR CURIOUS AMUSEMENTS FOR THE INGENIOUS and subtitled: "To Which are Added the Most Material Occurrences Foreign and Domestick". 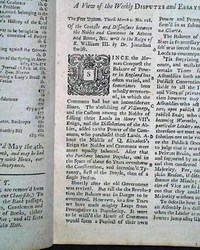 Published in London, and "Perform'd by a Society of Gentlemen" as noted in the masthead, the date is July 16, 1708. 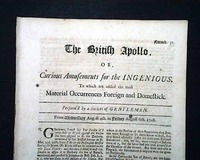 The British Apollo appeared twice a week until issue 79, and then three times a week. 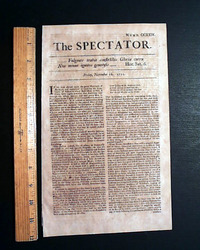 THE SPECTATOR, London, 1711-1712 (untrimmed) One of the most famous of the early newspapers & by the famed Addison & Steele. 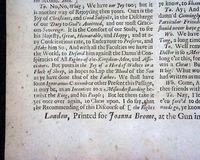 Nice condition, some foxing, single sheet. 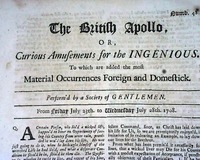 The image shown is representative of the condition and look of the issue you will receive. 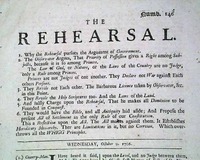 Actual dates vary but will be dated within 1711 or 1712. Note: No red ink stamps are present. 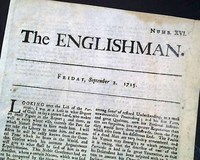 A quite uncommon single sheet newspaper which has comparatively large lettering in the masthead. 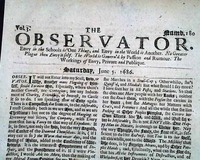 Rather than present news reports, this newspaper is almost entirely editorial, with much on politics. 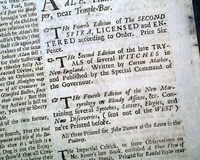 Half of the back page includes various "Advertisements". 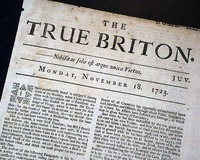 THE TRUE BRITON, London, Nov. 18, 1723 A quite uncommon single sheet newspaper which has comparatively large lettering in the masthead. 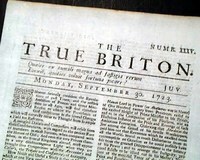 Rather than present news reports, this newspaper is almost entirely editorial, with much on politics. 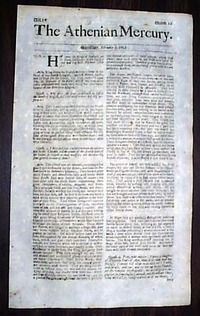 The back page has various "Advertisement". 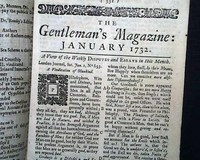 THE GENTLEMAN'S MAGAZINE, London, June, 1732 Near the back is the "Monthly Intelligencer" which includes a list of the: "Trustees Appointed for Establishing the New Colony in Georgia, Incorporated by a Charter now Passing" and which includes within the list: James Oglethorpe (see photos). 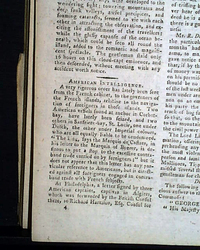 There is also a brief item: "From South Carolina". 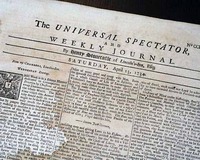 THE UNIVERSAL SPECTATOR & WEEKLY JOURNAL, London, March 2, 1734 A very uncommon & early title we have only seen once in our 35+ years in this business. 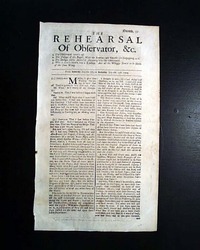 The four pages contain various news from London & elsewhere, plus letters and some advertisements which take up the entire back page. Measures about 10 by 13 1/2 inches, water staining & some foxing. A very uncommon & early title we have only seen once in our 39+ years in this business. 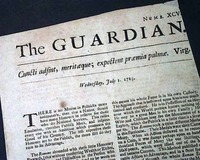 The four pages contain various news from London & elsewhere, plus letters and some advertisements, the latter taking up the entire back page.